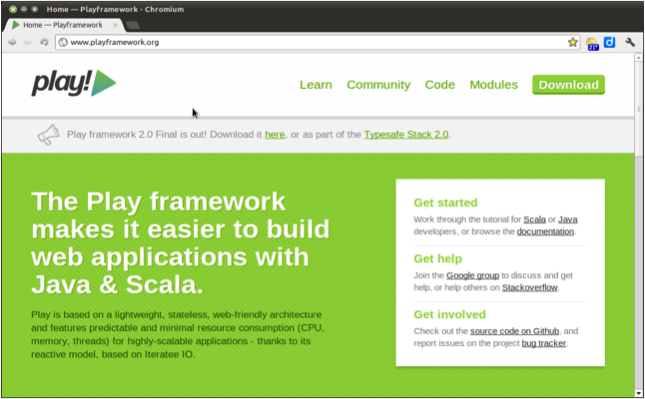 cloud computing | Having fun with Play framework! It’s usually the case that you start developing an application and go on fulfilling requirements. When your application grows bigger you start to realize the convenience of separating it into different components. Moreover, when you develop your second or third application, your begin to recognize certain features that could be reused across different applications. These are two good reasons to modularize an application. Ideally we should aim at components with high cohesion and low coupling. The Java language has proven itself quite fit to accomplish this kind of tasks. It provides general means to enforce the use of well defined API thru interfaces, abstract classes, etc. Java itself is a very generic programming language and not originally designed for web application development. 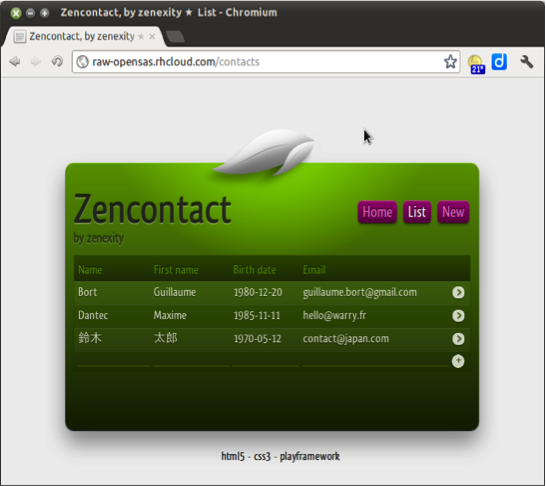 It is a very different thing to write a generic and reusable Java library and to create a web application. A web application itself doesn’t need to be designed to be reusable. You need less abstraction, less configuration. Reusability does exist for web applications, but through web service APIs rather than language-level integration. So when it comes to reusability, play provides us with a solution better suited for web applications. A module is just another Play framework application. The only difference is that a module is not meant to be run on his own, it needs to be included into a containing application. Nevertheless, there area a couple of differences between a module and a regular application, mainly that a module has no conf file (it has to be provided by the main application) and everything in a module is optional. Doing is better than saying, so as usual we will look for a fine opportunity to make a simple module to show how it works. As many of you already know, we are working on the spanish translation of play framework site. 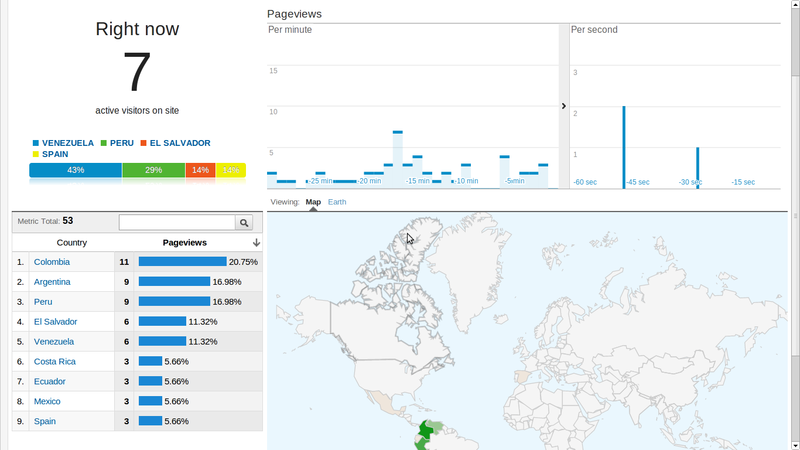 We wanted to add web analytics to it so that we can see how people were using it. So in order to follow this example, we’ll need a play framework app deployed somewhere on the Internet. Nowadays there are lots of Java hosting options available for free. 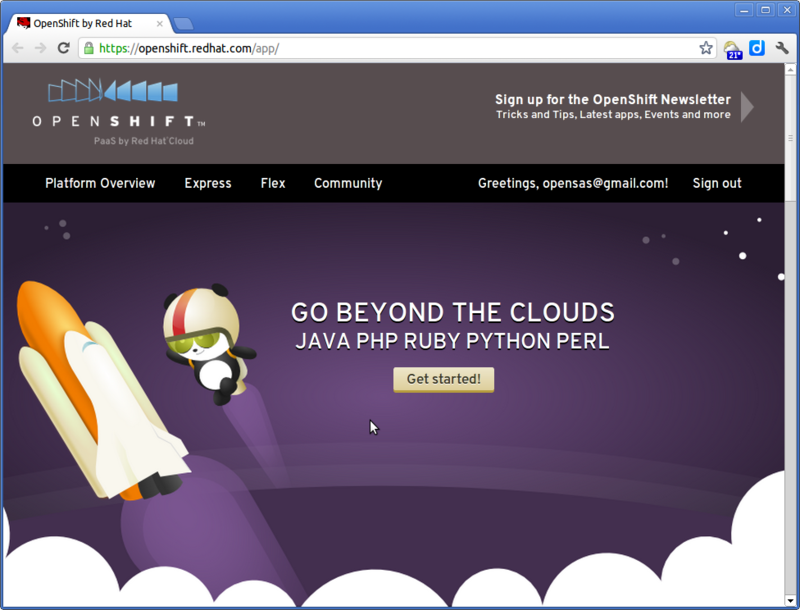 Here you have a couple of tutorials for deploying on openshift, google application engine and heroku. First let’s create a play framework application, I’ll create the app at ~/devel/apps/module-test, you can choose whatever location you like, just be sure to update the commands appropriately. git commit -m "deploy play framework app"
Note: The first time it will take a couple of minutes to push the application, because of play framework libraries. Later pushes will be much quicker, git is smart enough to only send updated files. And that’s it, you’ve just deployed your first app to red hat’s cloud. 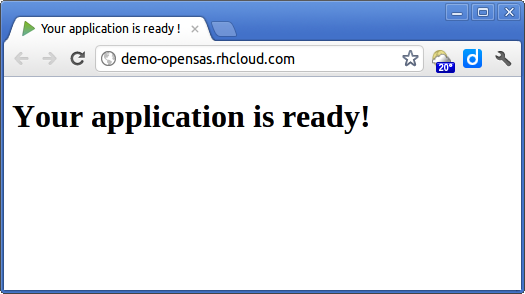 You can see it running at http://analyticsapp-opensas.rhcloud.com/ (of course, you’ll have to replace “opensas” with your own openshift user name). Adding Google web analytics to a play app is really easy. You just need a gmail account, then go to Google Analytics web site, click on “sign up”, login with your gmail account, and complete all the required data. In the account name enter “analytics-app”, in the website’s url enter http://analyticsapp-opensas.rhcloud.com/, agree to the terms and conditions and click on “Create account”. Note: Google will provide you with your own UA-XXXXXXXX-1 account code, so just copy and paste the code from your Google analytics account page, and NOT from this page! Now you just have to generate the war folder, commit, and push it once again to openshift to deploy your changes. Every time you make a change you’ll have to follow these same steps to deploy it to openshift. 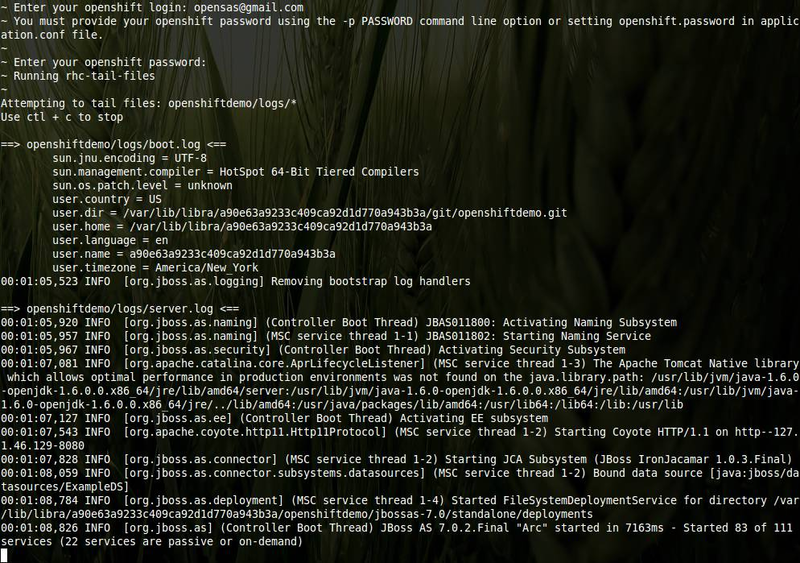 git commit -m "added tracking code"
Visit again your page at http://analyticsapp-opensas.rhcloud.com/, and see the source of the page to check that the tracking code has been added. You can also see it in action on Google’s analytics page, click on “Home”, Real-Time (BETA), and the Overview. You should have one visitor (yes, it’s you!). 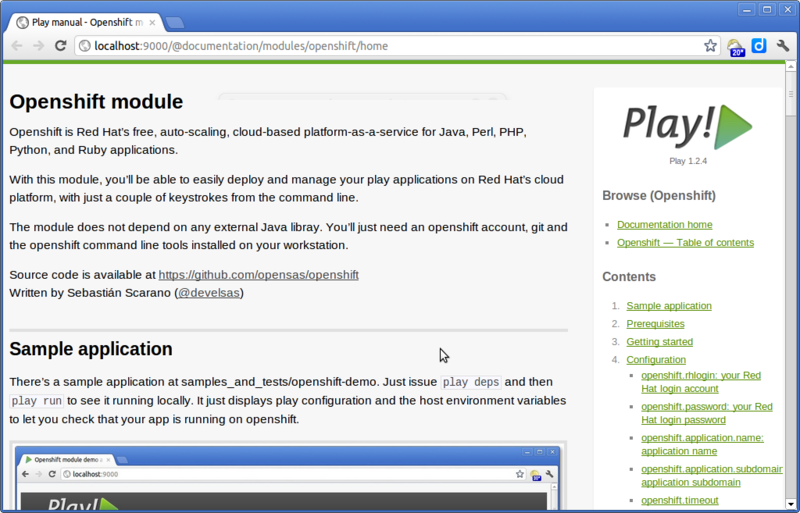 So far now we created a new play application and deployed it to openshift. Then we created a Google analytic account and added the tracking code the our play application. Everything is working ok and our app is being tracked by Google. Now we are going to move that functionality to a module so that we can reuse it from other apps. Now, in order to tell our main application (in our case analytics-app) to include this module, we have to configure a local repository. and after that run the following command to tell play to resolve dependencies. You can see your app running at http://localhost:9000. This tag will will update the tracker every time the page is rendered, even when we are working on our development workstation! So we will add a minor improvement to prevent the module from logging the page activity while working in development mode. git commit -m "added analytics module"
Run your site locally with “play run”, and also open it from http://analyticsapp-opensas.rhcloud.com/ (go on, give it a try, every click counts), check the source code of both sites, you should see that the app running at openshift contains the tracking code, contrary to your local application. In this post we saw how to deploy a play framework app to openshift and, more important, how to move features from your application to a module in order to reuse it from other applications. You can learn more about modules on this article or reading play’s documentation. If you speak spanish you can help us with the translation, and you can also have a look at our work right here… You can be sure every click you make will be tracked!